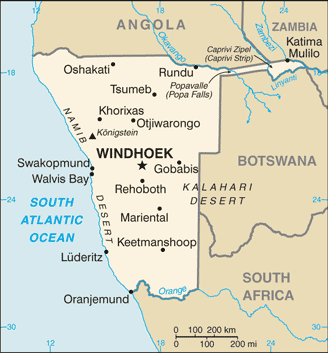 Namibia /nəˈmɪbiə/, officially the Republic of Namibia (Afrikaans: Republiek van Namibië; German: About this sound Republik Namibia (help·info), is a country in southern Africa whose western border is the Atlantic Ocean. It shares land borders with Angola and Zambia to the north, Botswana to the east and South Africa to the south and east. Although it does not border with Zimbabwe, less than 200 metres of riverbed (essentially the Zambia/Botswana border) separates them at their closest points. It gained independence from South Africa on 21 March 1990, following the Namibian War of Independence. Its capital and largest city is Windhoek. Namibia is a member state of the United Nations (UN), the Southern African Development Community (SADC), the African Union (AU), and the Commonwealth of Nations.